Over the last month, the Bedford property market has seen some interesting movement in house prices, as property values in the Bedford Borough Council area rose by 1.5% in the last month, to leave annual price growth at 14%. These compare well to the national figures where property prices across the UK saw a monthly uplift of 0.42%, meaning the annual property values across the Country are 8.3% higher, this is all despite the constraining factors of Stamp Duty changes in the spring and more recently our friend Brexit. Looking at the figures for the last 18 months makes even more fascinating reading, whereby house prices are 20.3% higher, again thought provoking when compared to the national average figure of 13.6% higher. However, it gets more remarkable when we look at how the different sectors of the Bedford market are performing. Over the last 18 months, in the Bedford Borough Council area, the best performing type of property was the semi, which outperformed the area average by 0.8% whilst the worst performing type was the apartment, which under-performed the area average by 2%. Now the difference doesn’t sound that much, but remember two things, this is only over eighteen months and secondly, the gap of 2.8% (the difference between the semi at +0.8% and apartments at -2%) converts into a few thousand pounds disparity, when you consider the average price paid for a semi-detached property in Bedford itself over the last 12 months was £259,700 and the average price paid for a Bedford apartment was £146,300 over the same time frame. So what does all this mean to Bedford homeowners and Bedford landlords and what does the future hold? When I looked at the month-by-month figures for the area, you can quite clearly see there is a slight tempering of the Bedford property market over these last few months. I have mentioned in previous articles that the number of properties on the market in Bedford has increased this summer, something that hasn’t happened since 2008. Greater choice for buyers means, using simple supply and demand economics, that top prices won’t be achieved on every Bedford property. 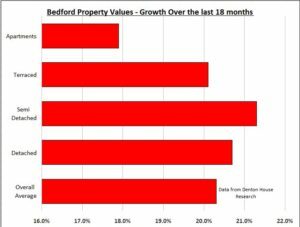 You see some of that growth in Bedford property values throughout early 2016 may have come about because of a surge in house purchase activity resulting from the increase in stamp duty on second homes from April, thus providing a temporary boost to prices. …And Bedford property values, assuming that everything goes well with Brexit, I believe in twelve months’ time we should see values in the order of 6% to 9% higher.